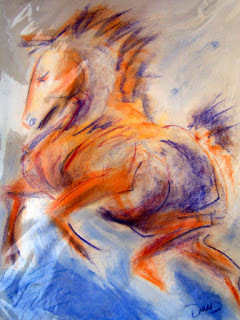 IT WAS ANNOUNCED TODAY that the modern equestrian artist Donna Bernstein, known as Donna B Art, opened her new show at Annona Restaurant, Manhattan Motorcar, in Westhampton Beach, New York over the July 4th weekend. Represented by Bob Deets of Galerie BelAge, the show highlights her distinctive large-scale horse paintings, composed of bold and dynamic colors, in uniquely stylized abstract forms. Not traditional in form or treatment, her horses speak to a new vision of powerful equine pageantry. Even smaller works, in charcoals and inks, are expressed as passionate four-legged wonders moving freely in space and time. Two brilliant bronze horses fill out the exhibit, creatively mounted on wood and stone, as well as a broad panel contemporary landscape in oils. The show exhibits a wide spectrum of her talent in various mediums and subject. The chic, modern décor of the restaurant is complemented by Donna’s vibrant and urban treatment of one of art’s oldest subjects – the eternal horse. Downstairs in sophisticated Manhattan Motorcar, the Ferrari’s seem to breathe this equestrian fire. Annona has become one of the Hampton’s favorite hotspots, and is the only such business currently accepting the global euro. A native New Yorker, Donna now lives in McCall, Idaho, a spectacular mile-high mountain retreat where she keeps her studio, and where her husband, Lex, maintains his year-round soccer coaching programs. They return to the New York area frequently. Galerie BelAge is a well-known full-service art gallery in the prestigious Westhampton Beach community. Its current show, “The Third Annual Outsider Art in the Hamptons: Internal Guidance Systems”, is on exhibit from Saturday, July 5, through September 7 at the gallery location, 8 Moniebogue Lane, Westhampton Beach. Donna’s show at Annona will continue through the Hampton Classic, on August 31, where she will also exhibit in the Boutique Garden. For further information about Donna and her work, contact Bob Deets at Galerie Bel Age, 631-288-5082 , or visit www.galeriebelage.com.